Rehabilitation for cardiac patients prior to the 1950s comprised abstention from all forms of physical activity. This was thought to diminish the cardiac load and assist in the reparative process of the healing myocardial scar.3 Levine and Lown4 appear to be the first to document challenging the idea of complete immobilisation by introducing the then controversial ‘armchair treatment’ where patients were encouraged to sit in an armchair as much as possible during hospitalisation postmyocardial infarction. When the weight of evidence suggesting the benefits of light-to-moderate activity in patients with chronic disease became irrefutable, exercise guidelines were created for this population.5 Interval training appears to have been first studied in cardiac rehabilitation in 1972, when patients were asked to cycle at high workloads for 60 s with a 30 s rest between intervals. Using the intervals, the patients were able to exercise for at least twice as long as what they were able to do when cycling continuously.6 In 1977, a study on healthy participants examined the effects of a 10-week programme which included a combination of interval and moderate continuous training. Interestingly, the authors found a linear increase in augmenting maximal oxygen uptake (VO2max) over 10 weeks, contrary to the study's hypothesis that VO2 would plateau over time.7 In 1979, it was suggested that high-intensity exercise was required to provoke the necessary training adaptations needed to improve exercise capacity in patients with recent myocardial infarctions.8 One of the first studies to investigate intense exercise in patients with cardiovascular disease found that if the exercise is intense and prolonged enough, then it can instigate a reduction in myocardial ischaemia.9 These findings were revolutionary, as they were established before widespread percutaneous coronary interventions were performed. From there, differing study protocols in the 1980 s and 1990 s in cardiac patients led to conflicting findings that appear to have decreased the interest in this approach.10–12 Forty years after the first reported use of interval training in cardiac patients, the interest in high-intensity interval training (HIIT) in higher risk patients has now led to a number of studies in this area. VO2max is a strong predictor of mortality.16 Indeed, a 1-metabolic equivalent task (MET) increase is associated with a 10–25% improvement in survival.17 Furthermore, it is established that cardiorespiratory fitness is more cardioprotective than the overall physical activity levels.18 This provides further evidence regarding the benefits of higher intensity exercise compared with lower intensity general physical activity. It seems likely that improving VO2max will improve the prognosis of patients with chronic disease. The aim of this systematic review is to compare and quantify the effects of HIIT against moderate-intensity continuous training (MICT) in improving VO2max in patients with lifestyle-induced chronic diseases. Furthermore, safety of HIIT will be discussed along with the feasibility of this approach with suggestions to standardise terminology and protocol recommendations. Electronic searching of the MEDLINE, PubMed, EMBASE and Cinahl databases were conducted from the earliest available date to April 2013, limited to the English language. The Medical Subject Heading (MeSH) database was employed to establish all related articles on HIIT and chronic disease. The MeSH terms used were ‘cardiovascular diseases’ OR ‘metabolic diseases’ OR ‘chronic diseases’ and their related terms. Text words used in conjunction with the MeSH terms were ‘high intensity training/exercise’, OR ‘interval training/exercise’, OR ‘intermittent training/exercise’, OR ‘low volume training/exercise’ OR ‘aerobic interval training/exercise’. Reference lists of retrieved articles were also searched for in other appropriate studies. Only full text, randomised control trials were considered for inclusion. The studies were required to have a cardiometabolic chronic disease population, where poor lifestyle is considered to be the main contributor. The main characteristics of such diseases, such as coronary artery disease, heart failure, diabetes, hypertension, obesity and metabolic syndrome, are recognisable by the common presence of cardiovascular risk factors. Other systematic reviews on the effects of HIIT have been conducted with specific conditions: pulmonary disease15 and coronary artery disease.19 Inclusion criteria were: exercise protocols using cardiorespiratory exercise training; a comparator group that completed MICT (matched to HIIT); an accepted measure of intensity (ie, heart rate or rating of perceived exertion); intervention of 4 weeks; appropriate intensities for both groups (eg, 60–75% peak heart rate (PHR) for MICT, 85–95% PHR for the high-intensity intervals or 80–100% peak work rate (PWR)) and a direct measure of the VO2peak/max. Owing to the difficulty patients with chronic disease have in reaching a plateau in the VO2max, the VO2peak was reported in nine of the studies.20–28 Studies including other activities (eg, resistance training) on top of the prescribed aerobic intervention were also included, provided the same volume and modality of resistance exercises were given to the MICT and HIIT groups. The procedural quality of the studies was assessed by use of the modified Physiotherapy Evidence Base Database (PEDro) scale. Table 1 illustrates that one point was awarded for each of the 10 criteria. Review Manager statistical software V.5.0 (Nordic Cochrane Centre, Copenhagen, Denmark) was used to determine the mean difference and 95% CI. A forest plot is used to portray the treatment effects of each study (figure 1). The quality assessment of the studies was determined by two reviewers. Where there was a discrepancy, the average was taken. The studies achieved a mean PEDro score of 7.35/10. There was no blinding of all assessors in any of the studies reviewed. A between-group statistical comparison was provided by all studies with measures of variability given for the VO2peak. Nine studies included means and SDs of the VO2peak to allow the calculation of an overall mean difference.20–27 ,31 One study provided means±SE of mean, allowing the SDs to be calculated.28 Homogeneity between the studies was displayed with I2=9%, p=0.36. The mean difference in the VO2peak from the 10 studies was 3.03 mL/kg/min (95% CI 2.00 to 4.07), significantly (p<0.001) favouring HIIT (figure 2). Forest plot of included studies. Seven studies used uphill walking/running on a treadmill as the primary exercise modality.20–22 ,25–27 ,31 One study described the exercise undertaken as ‘treadmill walking’; therefore, the differences in heart rate between intervals could have been achieved either through a change in speed or a change in incline.22 In three studies, cycle ergometers were used for the duration of the programme.23 ,24 ,28 Freyssin et al24 used strengthening, stretching and relaxing exercises in addition to the treadmill and cycle programme. Owing to the constant changes in the heart rate response to exercise, supervision allows for a closer monitoring to ensure that the rates are within the desired zones. Therefore, the presence of a supervisor is quite likely to improve the accuracy of the intensity. 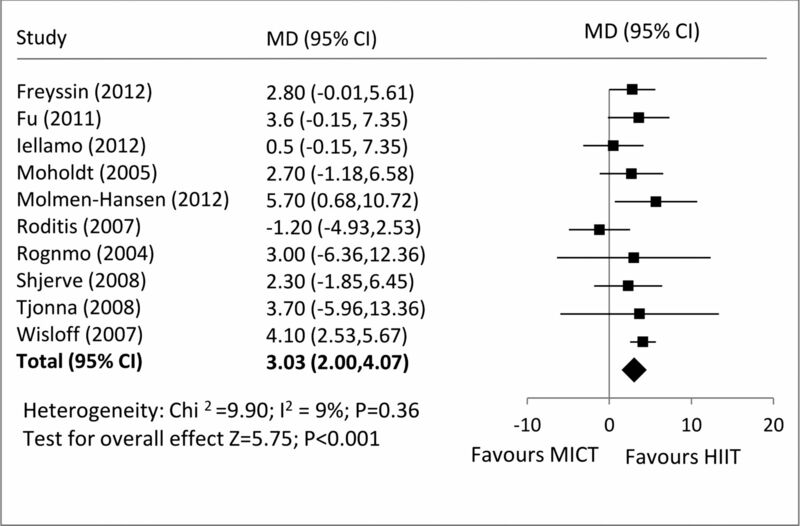 Adaptations occurring significantly more with HIIT compared with MICT are shown in box 1. The study by Tjonna et al31 found that MICT and HIIT both reduced blood pressure, approximately 10 mm Hg systolic and 6 mm Hg diastolic. Molmen-Hansen et al25 also showed a significant reduction of 12 mm Hg for systolic blood pressure in the HIIT group. Other studies showed no change in systolic blood pressure after the interventions. Significant reductions in oxidised low-density lipoproteins were found in HIIT but not MICT.20 ,31 However, in one study, the opposite was found.26 Furthermore, it was established that high-density lipoprotein was increased by 25% in the HIIT group.31 These changes were supported by Wisloff et al20 who also found an increase in high-density lipoprotein, lower triglycerides and improved fasting glucose in the HIIT group. An improvement in triglycerides was identified by Moholdt et al22 for the HIIT and MICT groups. Iellamo et al27 found no significant differences in the metabolic profile (lipids, homeostasis model assessment-insulin resistance (HOMA-IR)), with the exception of an improvement in fasting glucose with HIIT. Fu et al28 found improvements in oxidative stress/inflammatory markers plasma brain natriuretic peptides, myeloperoxidase and interleukin-6. The findings from Tjonna et al31 showed increased circulating adiponectin and improved insulin sensitivity and β-cell function in the HIIT group. No changes in adiponectin were found by Moholdt et al22 at 4 weeks; however, after the 6-month intervention, HIIT and MICT increased the circulating levels. The main finding from this meta-analysis is that HIIT is superior to MICT in improving CRF in patients with lifestyle-induced chronic diseases. Indeed, the increase in the VO2peak with HIIT was almost twice the increase gained from MICT. In addition, although there are limited data, HIIT appears to be well tolerated and safe. HIIT increased the VO2peak by 5.4(19.4%) compared with 2.6 mL/kg/min (10.3%) with MICT. It has been shown that a 1-MET (3.5 mL/kg/min) increase is associated with 10–25% improvement in survival.17 Indeed, the protective role of fitness occurs even in the presence of established cardiovascular disease risk factors.32 CRF is an easily modifiable risk factor; therefore, identifying the most effective way to improve VO2peak should be a health priority. Some of the studies investigated mechanisms explaining the greater improvement of the VO2peak with HIIT. Peripheral adaptations leading to improvements in CRF were investigated by measuring PGC-1α and Ca2+ reuptake into sarcoplasmic reticulum in the skeletal muscles. Mitochondrial dysfunction is central to most chronic diseases and could play a vital role in the reduced CRF that is experienced by these populations. Improvements in mitochondrial biogenesis have been demonstrated by increases in PGC-1α after a single bout of low volume HIIT.33 Studies by Tjonna et al31 and Wisloff et al20 identified significant increases in PGC-1α (138% and 47%, respectively), indicating mitochondrial biogenesis in the HIIT group. Wisloff et al20 found the increase in PGC-1α to be strongly correlated with the improved VO2peak (r=0.72, p<0.01), supporting the influence of mitochondrial function on exercise capacity. Mitochondrial biogenesis is essential to maintain the structural integrity of skeletal muscle. Daussin et al34 concluded that a fluctuation in ATP turnover in interval training, which is different from the usual steady-state conditions of ATP production, activates the signalling pathways, which lead to increases in PGC-1α. The increase in PGC-1α identified by Wisloff et al and Tjonna et al may translate into improvements in aerobic and functional capacity. Both studies also significantly increased the maximal rate of Ca2+ reuptake into the sarcoplasmic reticulum by 50–60%.20 ,31 The increase in calcium cycling reduces skeletal muscle fatigue and would contribute to improvements in muscle function and therefore CRF. The findings by Fu et al28 demonstrate repeated bouts of deoxygenation in HIIT but not MICT, which may contribute to the observed adaptations to the muscles’ oxidative capacity. Improvement in the VO2peak with HIIT can also be explained mechanistically by central factors. Findings from one of the studies indicate that HIIT improved ejection fraction in patients with heart failure to the same degree as treating with ACE inhibitors and β-blockers, outlining the potential for further left ventricular remodelling with HIIT (Wisloff20). Improvements in cardiac remodelling are supported by the findings of Fu et al,28 with significant reductions in brain plasma natriuretic peptide levels. HIIT may also contest modern medical treatments in improving systolic and diastolic blood pressure, with significant decreases of 12 and 8 mm Hg, respectively, found in patients with hypertension.25 It was also found that the myocardial contractile function was improved with HIIT in terms of stroke volume, mitral annular excursion, ejection velocity and systolic mitral annular velocity. Besides a small reduction in the left ventricular filling pressure with MICT, the aforementioned improvements in systolic and diastolic function with HIIT were not found with MICT. The HERITAGE study has established the influence genetic components have on the trainability of the VO2max in certain individuals, resulting in ‘non-responders’ to exercise training.35 The consistently large improvements in the VO2max seen in a variety of cohorts in the HIIT studies questions whether this type of training can ameliorate the familial dampening of VO2 in these ‘non-responders’. Only one study in 1986 has examined the relationship between HIIT and hereditary trainability.36 Although aerobic capacity was not assessed in this study, it was found that genotype was associated with anaerobic capacity after a HIIT training intervention, suggesting that the effectiveness of HIIT is affected by hereditary factors.36 Indeed, in the studies reviewed in the meta-analysis, the SD of the change in the VO2peak in the HIIT group was 26% (relative to the mean change), whereas the MICT group had only an 8% variance. Future studies are needed to further compare the effects of HIIT and MICT on the VO2peak trainability. In addition to CRF, efficacy can also be assessed by the effect on cardiometabolic risk factors. The studies reviewed found reductions in risk factors in HIIT notwithstanding the differences in body mass, body mass index or weight loss between HIIT and MICT. These findings are supportive of the theory of ‘fitness over fatness’—in that it is more beneficial to health to improve physical fitness than to focus solely on weight loss. This is supported by Terada et al37 who found similar reductions in body fat percentage in the HIIT and MICT groups after a 5 day/week, 12 week programme. Although weight loss was not different between groups, one study found a reduction in the FATP-1 and FAS levels in the HIIT group, suggesting a suppression of fatty acid uptake and lipogenesis. No studies measured visceral adiposity; however, the existence of increased circulating adiponectin levels found with HIIT but not MICT is suggestive of decreased intra-abdominal obesity. Owing to the augmented PHR and cardiac output that is experienced in HIIT, it is quite likely that pulsatile and shear stress influence vasculature during periods of intense exercise.38 Interval exercise has been shown to reduce arterial stiffness through increased distensibility of the vessels.38 ,39 A recent study by Smart and Steele40 demonstrated no difference in fitness and cardiac function between moderate training and intermittent training groups matched by the volume of work. However, the intervals were not high intensity, suggesting that to elicit changes, intervals need to increase the heart rate to a certain level. Arterial stiffness is a key contributor to a number of cardiovascular conditions that influence mortality through cardiovascular disease.41 Two studies demonstrated higher endothelial derived nitric oxide production in the HIIT group.20 ,31 It is suggested that shear stress through an increase in pulse and frequency pressure promotes vasodilatory nitric oxide release, thereby increasing arterial compliance.42 This is further supported by Wisloff et al20 and Tjonna et al31 who found greater increases in flow-mediated dilation in HIIT than in MICT. The improvements in endothelial function are supported by the findings from Fu et al.28 The study's findings demonstrate an increase in perfusion and oxygen utilisation between cerebral and muscular tissues, which occurs through increases in shear flow and metabolic stress. The increased perfusion to the vastus lateralis and frontal cortex would promote increased flow and shear stress and therefore the release of NO. A recent study by Rognmo et al 43 aimed to assess the safety of HIIT compared to MICT, during and after exercise, in patients with coronary heart disease in cardiac rehabilitation. The study of 4846 participants indicated that the risk of a cardiovascular event occurring is low in MICT and HIIT. During this study, there was one fatal cardiac event during MICT and two non-fatal cardiac events during HIIT. The calculated event rates were 1/129 456 h of moderate-intensity exercise and 1/23 182 h of high-intensity exercise. Moreover, when vigorous intensity exercise was energy matched with moderate-intensity exercise, greater cardioprotective benefits were elicited. To accurately assess a cardiac event occurring during training, the study required a sample size of >20 500 patients. Despite the study being underpowered,44 the results explore the beneficial dose–response relationship associated with HIIT and the negligible risk that is involved. The safety of HIIT has been controversial among health professionals treating high-risk populations. This has perhaps been created through a common avoidance of anginal episodes, which can sometimes be triggered by high-intensity exercise. Although commonly thought to be a dangerous byproduct of exercise, episodes of controlled ischaemia may actually be beneficial in preventing secondary conditions in coronary artery disease through ischaemic preconditioning.45 Exercise-induced coronary collateral formation is based on the vascular endothelial growth factor, and this adaptation is correlated with exercise intensity. Lu et al46 found that exercise-induced intermittent ischaemia promoted coronary angiogenesis by the vascular endothelial growth factor. The favourable effects of intermittent exercise on angiogenesis is further supported in a meta-analysis on peripheral arterial disease.47 In a study by Lu et al, a normal cardiac troponin I indicated that no myocardial damage occurred when ischaemia was applied. Lu et al state that HIIT is safe even for patients with high-risk chronic disease with stable angina. Rather than promoting the instigation of angina in HIIT, this information is intended to highlight the safety of HIIT in high-risk populations. Caution should be exercised on a case-by-case basis depending on the participant's cardiac history. Indeed, despite the patients in the studies reviewed being a high-risk cohort, they were only included if their diseases were relatively well controlled or stable. Therefore, these findings may not be applicable to some patients in these disease groups. Box 2 provides a suggested guide of contraindications for participation in HIIT in high-risk patients. In summary, when used with appropriate screening and communication with the patient's doctor, HIIT can be a safe option for patients with high risk. Although this review provides the basis for further clinical trials testing of HIIT in rehabilitation of patients with chronic disease, all the studies analysed experienced methodological limitations. Although three of the studies used a different training protocol to the other seven, the heterogeneity of the VO2peak measure was low (χ2=9.90, I2=9%, p=0.36).23 ,24 ,28 Owing to the relatively recent interest with HIIT in chronic disease, HIIT training guidelines have not yet been created. Consequently, current research consists of a variety of intervals, intensities and programme durations. Furthermore, comparison of studies proves difficult when volumes of HIIT and MICT are equated in different ways. There are also discrepancies in the percentage of heart rate used. Some of the studies used a higher definition of moderate intensity (75%) to the general intensity of moderate exercise suggested by Norton et al (55–70% MHR) and the American College of Sports medicine (ACSM; 60–70% MHR).2 ,20 ,21 ,48 Not all studies included assessor blinding of the VO2peak, which may have influenced the testing results. Also, studies in cardiac rehabilitation programmes may have been guided by other confounding factors such as dietary advice or smoking status. A limitation of this review is that 6 of the 10 studies reviewed are from the same research group. It is important that these findings are replicated in future studies at other institutions. The studies reviewed consisted of small sample sizes, with one study including an unequal male-to-female ratio.20 The current literature is lacking in HIIT studies on all the chronic diseases. This systematic review on the cardiometabolic lifestyle-induced chronic diseases would have benefited from studies with other lifestyle diseases such as type II diabetes and chronic kidney disease. Owing to the limited research in this area, a variety of diverse diseases were included under the title cardiometabolic disease for this meta-analysis. However, the pathophysiology of the varied diseases may mean that HIIT will have different influences on the parameters being compared among different studies. Research on more chronic diseases will allow specific prescription guidelines to be recommended. Future research is needed to establish the optimal protocol of HIIT. However, based on the findings from this review, recommendations in table 2 are provided. It is important to note that the effectiveness and adherence to different HIIT protocols will always be highly individualised. The duration of intervals can differ greatly in various HIIT protocols. Two studies which used shorter duration intervals of 30 s showed no improvements and smaller improvements in the VO2peak, respectively.23 ,24 Studies which demonstrated the biggest changes in the VO2peak after a HIIT intervention used the 4×4 approach (4 intervals at 4 min each between 90% and 95% PHR).20–22 ,25 ,26 ,31 The recommendation of the 4×4 approach (∼40 min duration) in table 2 does not preclude shorter duration HIIT protocols being potentially more appropriate. However, more research is needed to compare a shorter duration of HIIT with the current recommendation. Furthermore, future research comparing HIIT and MICT should ensure that MICT is kept consistent with current definitions of moderate exercise. The intensity and duration of the recovery period in HIIT may play just as integral role as the interval period. Past research has suggested that an active recovery is recommended in order to effectively aid the process of lactate removal.49 However, a study by Dupont et al50 indicated that during the active rest period there was less replenishment of oxygen in myoglobin and haemoglobin and a reduced rate of resynthesis of phosphocreatine from the previous work phase. Meyer et al's study51 on patients with chronic heart failure found that short intervals (30 s) with passive recovery provided the most benefit (longest time to exhaustion in an exercise test). This study also determined that including a passive recovery instigated a lower rating of perceived exertion as indicated on the BORG scale, despite having a higher oxygen pulse, which is dependent on the stroke volume and arteriovenous difference.51 Logistically, it may be more practical and convenient to include an active recovery for the purpose of timing and equipment control, albeit at as low an intensity as possible. To successfully employ HIIT, recovery intensities need to be achieved. If the heart rate is not reducing to the required intensity by the end of the recovery period, the interval work rate should be adjusted accordingly. Indisputably, the success of an exercise intervention and maximising long-term benefits relies directly on adherence to the exercise programme. Central to adherence is the enjoyment of the activity being prescribed. Bartlett et al52 found that the ratings of perceived enjoyment after HIIT were higher when compared to MICT. It was identified in this study that the rating of perceived exertion had a positive correlation with enjoyment, through a likely combination of stimulation and accomplishment. Wisloff et al's20 study addresses the feasibility of HIIT being performed independently. During home sessions, participants were provided with heart rate monitors that recorded heart rate data. These monitors were placed so that they could not be seen by the participant. The patients achieved the correct heart rate zones without feedback from the heart rate monitor. The design of this study supports the feasibility of incorporating HIIT into a real-world situation, where a home HIIT programme can be successfully prescribed after a familiarisation period. This is further supported by Moholdt et al,53 who demonstrated that adherence to a home programme of HIIT was as suitable as the usual cardiac residential care. Given the small number of studies conducted thus far, there are still important questions that need to be addressed. Similar to current issues with the dose response of less intensive exercise, much more work is needed to determine if the recommendations provided here provide the optimal approach for future studies. Furthermore, it is realistic that most people will combine HIIT with MICT; therefore, determining the optimal ratio of both types of training over longer periods of time is also important. Similarly, current guidelines for all populations recommend the inclusion of resistance training in an exercise programme; yet the interaction between HIIT and resistance training is unknown. As it is likely that most people will include HIIT and resistance training in the same session, future studies should identify the ratio of HIIT and resistance training needed for optimal benefits. Analogous to the clinical trial phases in the development of a new pharmaceutical product, the evaluation of HIIT training for patients with cardiometabolic diseases would be in phase 2 (assessing efficacy). Indeed, the guidelines for clinical populations should use the same approach and criteria as other therapies (eg, drugs), with eventual recommendations based on large randomised control trials and not on small feasibility and efficacy studies alone. Another important question is regarding adherence after the supervised programme. Future studies should determine whether this approach is sustainable in a non-supervised, home-based environment. The terminology used to describe HIIT varies across research groups. The Norwegian research group that has conducted the majority of studies in this area has preferred the term ‘aerobic interval training (AIT)’. Other prominent groups have used ‘SIT’ to describe all-out supramaximal (>100% VO2max) intervals in studies with healthy individuals14 ,54 or low-volume HIIT when short intervals (∼30 s) with an intensity <95% are used.55 ,56 We suggest that the classification scheme shown in figure 3 is used to standardise terminology in future studies. This approach is based on (1) the widespread media use of the term ‘HIIT’ rather than ‘AIT’ for nearmaximal intensity (80–100% PHR) intervals, (2) the additional information regarding the intensity of the interval provided by HIIT compared to AIT and (3) the need to separate all-out supramaximal sprint interval training from HIIT as there are concerns for the safety of this all-out approach in clinical populations. Furthermore, it is suggested that, in comparative studies, the term ‘moderate-intensity continuous training’ (MICT) should be used, where appropriate. Suggested classification scheme for interval training based on exercise intensity. This meta-analysis has identified that HIIT has more physiological benefits than MICT in patients with lifestyle-induced cardiometabolic disease. HIIT significantly improved CRF by almost double that of MICT (19.4% vs 10.3%). This should translate into greater decreases in risks of morbidity and all-cause mortality. Incorporation of HIIT into a rehabilitation programme may be a more achievable way for people with chronic disease to reach a level of exercise that promotes health enhancing benefits. These findings suggest that future exercise guidelines for lifestyle-induced cardiometabolic disease should incorporate HIIT. There are various logistical considerations that contribute to the feasibility of a HIIT programme; however, if participants are adequately screened and the programme is prescribed and supervised by appropriately trained and qualified individuals, then it should be an achievable training option. High-intensity interval training (HIIT) is superior to moderate-intensity continuous training in improving cardiorespiratory fitness in lifestyle-induced cardiometabolic diseases. HIIT is well-tolerated, safe and improves the quality of life. Central and peripheral adaptations are responsible for the superior benefits of HIIT.
. Effects of exercise and diet on chronic disease. J Appl Physiol 2005;98:3–30. American College of Sports M. ACSM's guidelines for exercise testing and prescription. Philadelphia, PA: Lippincott Williams & Wilkins, 2010.
. The speed of healing of myocardial infarction: a study of the pathologic anatomy in seventy-two cases. Am Heart J 1939;18:647–71.
. ‘Armchair’ treatment of acute coronary thrombosis. JAMA 1952;148:1365–9.
. Rehabilitation of the cardiac patient. JAMA 1957;164:225–31.
. Use of the interval work capacity test in the evaluation of severely disabled patients. J Chronic Dis 1972;25:345–52.
. Linear increase in aerobic power induced by a strenuous program of endurance exercise. J Appl Physiol 1977;42:372–76.
. Effects of physical training on cardiovascular function following myocardial infarction. J Appl Physiol 1979;47:482–9.
. Effects of 12 months of intense exercise training on ischemic ST-segment depression in patients with coronary artery disease. Circulation 1981;64:1116–24.
. Comparison of high- and low-intensity exercise training early after acute myocardial infarction. Am J Cardiol 1988;61:26–30.
. Efficacy of high-intensity exercise training on left ventricular ejection fraction in men with coronary artery disease (The Training Level Comparison Study). Am J Cardiol 1995;76:643–7.
. Interval training in patients with severe chronic heart failure: analysis and recommendations for exercise procedures. Med Sci Sports Exerc 1997;29:306–12.
. 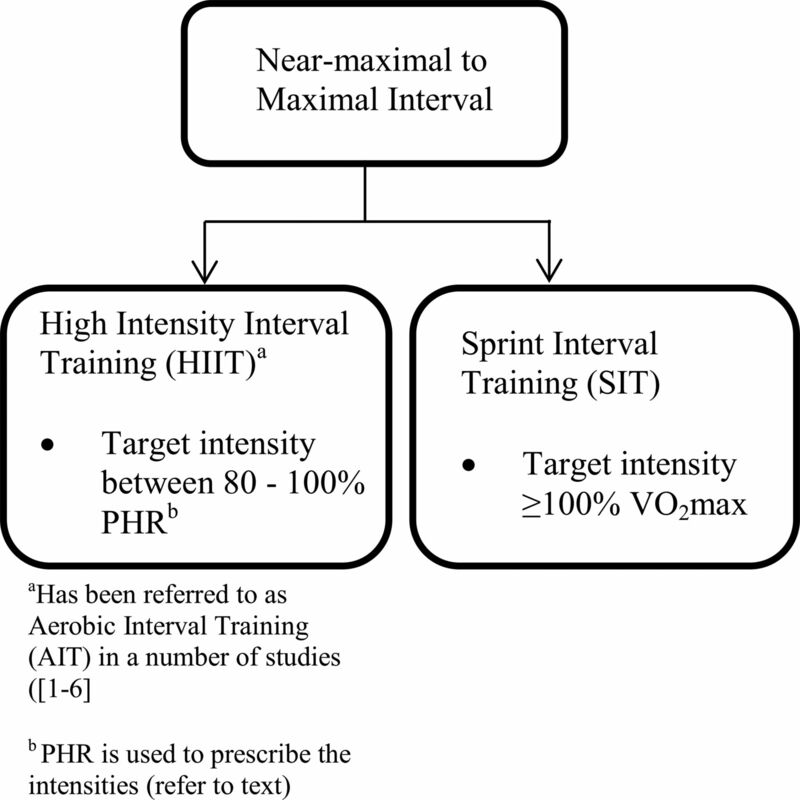 Influence of high-intensity interval training on adaptations in well-trained cyclists. Natl Str Cond Assoc 2005;19:527–33.
. Short-term sprint interval versus traditional endurance training: similar initial adaptations in human skeletal muscle and exercise performance. J Physiol 2006;575:901–11.
. Interval versus continuous training in individuals with chronic obstructive pulmonary disease—a systematic review. Thorax 2010;65:157–64.
. Influences of cardiorespiratory fitness and other precursors on cardiovascular disease and all-cause mortality in men and women. JAMA 1996;276:205–10.
. The importance of cardiorespiratory fitness in the United States: the need for a national registry: a policy statement from the American Heart Association. Circulation 2013;127:652–62.
. Comparisons of leisure-time physical activity and cardiorespiratory fitness as predictors of all-cause mortality in men and women. Br J Sports Med 2011;45:504–10.
. Interval training for patients with coronary artery disease: a systematic review. Eur J Appl Physiol 2011;111:579–89.
. Superior cardiovascular effect of aerobic interval training versus moderate continuous training in heart failure patients: a randomized study. Circulation 2007;115:3086–94.
. Aerobic interval training versus continuous moderate exercise after coronary artery bypass surgery: a randomized study of cardiovascular effects and quality of life. Am Heart J 2009;158:1031–7.
. The effects of exercise training on the kinetics of oxygen uptake in patients with chronic heart failure. Eur J Cardiovasc Prev Rehabil 2007;14:304–11.
. Cardiac rehabilitation in chronic heart failure: effect of an 8-week, high-intensity interval training versus continuous training. Arch Phys Med Rehabil 2012;93:1359–64.
. Aerobic interval training reduces blood pressure and improves myocardial function in hypertensive patients. Eur J Prev Cardiol 2012;19:151–60.
. Both aerobic endurance and strength training programmes improve cardiovascular health in obese adults. Clin Sci (Lond) 2008;115:283–93.
. Matched dose interval and continuous exercise training induce similar cardiorespiratory and metabolic adaptations in patients with heart failure. Int J Cardiol 2012;167:2561–5.
. Aerobic interval training improves oxygen uptake efficiency by enhancing cerebral and muscular hemodynamics in patients with heart failure. Int J Cardiol 2011;167:47–50.
. Effectiveness of high-intensity interval training for the rehabilitation of patients with coronary artery disease. Am J Cardiol 2005;95:1080–4.
. Effective training for patients with intermittent claudication. Scand Cardiovasc J 2005;39:244–9.
. Aerobic interval training versus continuous moderate exercise as a treatment for the metabolic syndrome: a pilot study. Circulation 2008;118:346–54.
. Exercise capacity and the risk of death in women: the St James Women Take Heart Project. Circulation 2003;108:1554–9.
. An acute bout of high-intensity interval training increases the nuclear abundance of PGC-1α and activates mitochondrial biogenesis in human skeletal muscle. Am J Physiol Regul Integr Comp Physiol 2011;300:1303–10.
. Effect of interval versus continuous training on cardiorespiratory and mitochondrial functions: relationship to aerobic performance improvements in sedentary subjects. Am J Physiol Regul Integr Comp Physiol 2008;295:264–72.
. Familial aggregation of VO2max response to exercise training: results from the HERITAGE Family Study. J Appl Physiol 1999;87:1003–8.
. Inheritance of human skeletal muscle and anaerobic capacity adaptation to high-intensity intermittent training. Int J Sports Med 1986;7:167–71.
. Feasibility and preliminary efficacy of high intensity interval training in type 2 diabetes. Diabetes Res Clin Pract 2013;99:120–9.
. Intermittent versus constant aerobic exercise: effects on arterial stiffness. Eur J Appl Physiol 2010;108:801–9.
. Effects of continuous vs. interval exercise training on blood pressure and arterial stiffness in treated hypertension. Hypertens Res 2010;33:627–32.
. A comparison of 16 weeks of continuous vs intermittent exercise training in chronic heart failure patients. Congest Heart Fail 2012;18:205–11.
. Clinical applications of arterial stiffness; definitions and reference values. Am J Hypertens 2002;15:426–44.
. Time course of endothelial adaptation after acute and chronic exercise in patients with metabolic syndrome. J Strength Cond Res 2011;25:2552–8.
. Cardiovascular risk of high- versus moderate-intensity aerobic exercise in coronary heart disease patients. Circulation 2012;126:1436–40.
. Swing and a miss or inside-the-park home run: which fate awaits high-intensity exercise training? Circulation 2012;126:1431.
. Prodromal angina limits infarct size. A role for ischemic preconditioning. Circulation 1995;91:291–7.
. Effect and mechanism of intermittent myocardial ischemia induced by exercise on coronary collateral formation. Am J Phys Med Rehab 2008;87:803–14.
. Exercise rehabilitation programs for the treatment of claudication pain: a meta-analysis. JAMA 1995;274:975–80.
. Position statement on physical activity and exercise intensity terminology. J Sci Med Sport 2010;13:496–502.
. Interval training for performance: a scientific and empirical practice: special recommendations for middle- and long-distance running. Part I: aerobic interval training. Sports Med 2001;31:13–31.
. Performance for short intermittent runs: active recovery vs. passive recovery. Eur J Appl Physiol 2003;89:548–54.
. High-intensity interval exercise in chronic heart failure: protocol optimization. J Card Fail 2011;18:126–33.
. High-intensity interval running is perceived to be more enjoyable than moderate-intensity continuous exercise: implications for exercise adherence. J Sports Sci 2011;29:547–53.
. Home-based aerobic interval training improves peak oxygen uptake equal to residential cardiac rehabilitation: a randomized, controlled trial. PLoS ONE 2012;7:e41199.
. Similar metabolic adaptations during exercise after low volume sprint interval and traditional endurance training in humans. J Physiol 2008;586:151–60.
. Low-volume high-intensity interval training reduces hyperglycemia and increases muscle mitochondrial capacity in patients with type 2 diabetes. J Appl Physiol 2011;111:1554–60.
. Physiological adaptations to low-volume, high-intensity interval training in health and disease. J Physiol 2012;590:1077–84. Contributors KW designed the search criteria, conducted the search, performed the statistical analysis, and drafted and revised the paper. UW assisted in the search and revised the drafted paper. JC assisted in designing the search criteria and revised the drafted paper and is the guarantor.